sorry ma… i got a new tattoo – CINECLAST • FILM, FOOD, & FOREIGN PLACES. My sweet mother still thinks the “VERITAS” that I got inked on my arm back in 199…. will one day wash off with enough soap. I mean, sure, with enough soap anything will wash off, but we all know it’s probably not going to happen. So while in Denver my old friend Tom Taddeo and I both got new Tattoos. We see each other once a year, having once lived together for many years and being super close, best of friends, we take the time to see each other once a year and visit someplace new. This is super important for me, and in a life that zooms by faster than I can register sometime, I feel like it grounds me, forces me to check in with myself, and to take the time to really appreciate what matters in life, mainly, taking the time to appreciate what really matters in life. Some people go to the mountain, some do yoga retreats, some people visit the holy pace. We go to random cities to eat steaks and drink beer. And yeah, get a tattoo I suppose. I love tattoos, and tattoo culture. All sides of it. I love people who get the dolphins on the foot and the tribal band around their meaty arms. 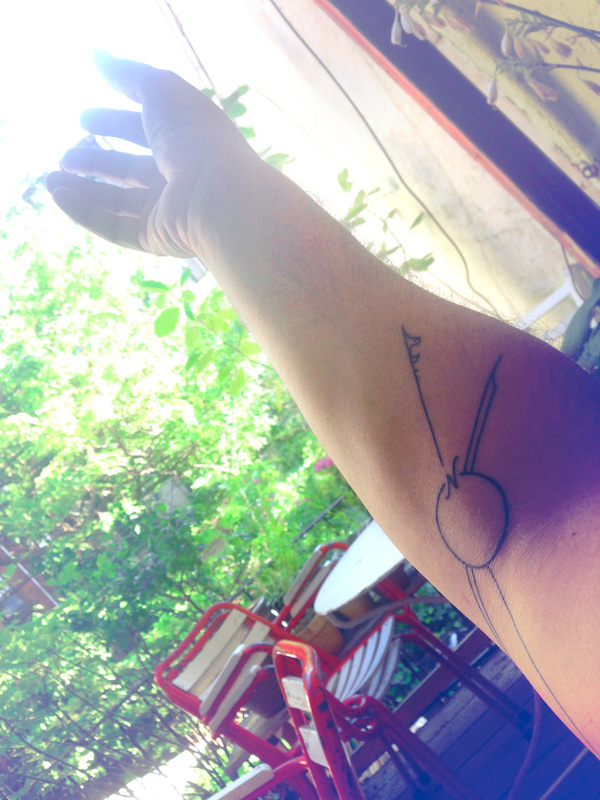 I love the sailor jerry hipster phenomena, and I love blind tattoos done by the brave/mindless. Do not be fooled; like other forms of writing, it is used for communication, and while a hand written letter might be “prettier” to some then a typed email, both serve the same purpose. In the end, it’s origin, author, and recipient all create a tattoo’s final meaning. This is why I think tattoos are wonderful. I have a few tattoos on my body. Those that have “serious” work done will look at mine and probably pass judgement. They are not done by anyone notable, or in a historic style of any sort. Others will look at them and not really understand, since they aren’t familiar, nor can I say that anyone else has them on their body. To me a tattoo needs to have two things; a personal reason and a unique design. So I was happy when Tom and I both wanted a similar tattoo. We’re old friends, have seen our share of fortune and folly, and the idea of another person sharing an indelible history with another was quite special. We drew our ideas on scratch papers and went to a little independent shop in Denver to have the artist help with the interpretation. It couldn’t be more perfect. Tattoos, at least for me, are not body art. They are more like tags that you would find on a garment or fine suit; they tell you information about the article, who made it, where it comes from, what it is made from, and how to care for it. That’s what makes tattoos special for me, and that’s how I choose them. They are the sort of thing that should be always true, no matter where, when, or how you find them.